Anthony Avent was born October 18, 1969 in Rocky Mount, North Carolina and grew up in Newark. A fan of Julius Erving and Kareem Abdul-Jabbar, he set his sights on the NBA at the age of 8. Tall and strong for his age, Anthony played basketball on the South Side playgrounds, polishing his inside skills and developing a reputation for toughness against older boys. He enrolled at Malcolm Shabazz High in 1983 and eventually grew to 6’9” and 200-plus pounds. Anthony’s size, talent and work ethic put him on the radar of several major programs, but he decided to stay local and accepted a scholarship from Seton Hall. He was one of four Proposition 48 recruits by coach PJ Carlesimo. Anthony worked hard off the court to become a competent student, and on the court to prepare for his first college season. As a freshman in 1988–89, he was the backup power forward for the 31–7 Pirates team that made it all the way to the NCAA title game. The following year, he put up solid numbers and earned a reputation for wearing down opponents with his rebounding and finishing skills. 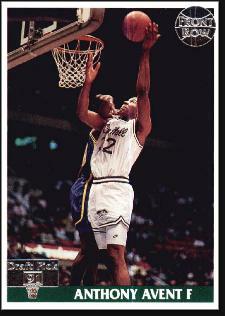 As a junior in 1990–91, Anthony averaged 17.8 points and 9.9 rebounds, leading Seton Hall to the Big East championship. The Pirates beat Georgetown in the tournament final, and he won his fierce head-to-head battle with Alonzo Mourning. Anthony was second-team All-Conference that year. Anthony decided to pass up his final season and take his game to the pros. He was selected by the Atlanta Hawks with the 15th overall pick, and then immediately included in a three-team trade that landed him in Milwaukee with the Bucks. 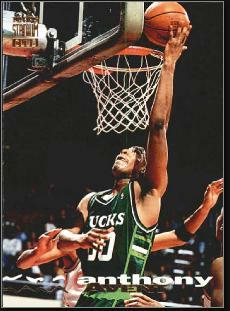 He was the team’s starting power forward as a rookie, and averaged 9.8 points and 6.2 rebounds a game. His best performance came in a November win over the Nuggets when he scored 28 points and had 8 rebounds, 3 assists and 3 steals. The Bucks traded Anthony to the Magic midway through his second NBA season. He went from a cellar-dweller to a 50-win club starring Penny Hardaway and Shaquille O’Neal. Unfortunately, Orlando was swept out of the playoffs in the opening round by the Pacers. After one more season with the Magic, Anthony played a year for the Grizzles before spending 1996–97 playing overseas in Greece. He returned to the states after a year and finished his NBA career with the Jazz and Clippers. He played one more season of pro ball in Greece before retiring. After basketball, Anthony got into real estate and sports management, and was a member of Newark’s 350th celebration committee. His son, Anthony Jr., starred for North Hunterdon High and played college ball at Fairleigh Dickinson.